sale. We also can design custom police badges. We are located in New Mexico. 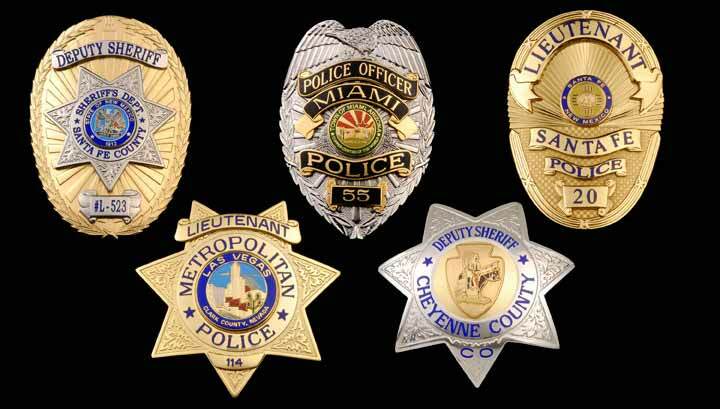 Custom police badges are crucial to decipher officers from the people they protect and the people we protect them from. We have an extensive catalog of badge styles that can be customized to fit the city and state that is being served. Want a line of completely unique police officer badges that have never been seen before? We can design a custom mold that best embody your police department that will be a strong symbol on the chests of some of America’s bravest. We don’t just service public police officers and firefighters; we also serve private security and patrol companies with a badge that best symbolizes your company and the employees that serve it. Along with our badges we make custom patches that will make for a sharp addition to uniforms that make a stern and professional appearance. When it comes to private security appearance, it’s just as important as standing your post. Our extensive background of being in law enforcement gives us the understanding of how much a badge and uniform means to the people that wear them. We go above and beyond the demands of our clients and create magnificent badges that give police officers and rescue workers an added sense of pride. Police officers and firefighters live and die by their badge and we do everything in our power to properly represent them. Please take a few moments and see all the great products we have to offer. Even though we are based in New Mexico, we have the capability to work with governments and companies nationwide.